Psalm 18 has been one of my favorites for years. 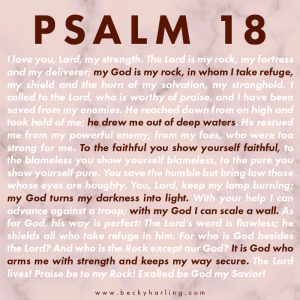 When I come to this Psalm in my daily Bible reading, I love to slow down and take a few days to just luxuriate in the richness of the promises tucked all throughout the Psalm. Honestly, it’s a great Psalm to use in your personal worship! In thinking about this, I thought I’d show you some of the ways I use this Psalm in my Praise times. Praise God for His Character Traits. Throughout this Psalm, David uses word pictures to describe the greatness of God’s character. He writes that the Lord is His rock, his fortress, his deliverer, his shield, the horn of his salvation, and a stronghold (Psalm 18:1-2). Go through the Psalm and circle all the word pictures David uses, and then use those phrases to praise God. Each word picture gives us a deeper understanding of God’s character. At times life can feel overwhelming. As you praise God for His character traits using word pictures to describe them, your faith will grow stronger and peace will overwhelm you. Lord Jesus, I praise You that You are a rock of faithfulness in my life. I praise You that You are my deliverer, and that when I feel attacked by the enemy You are my defense. I praise You that You act as a shield around my mind. When negative thoughts threaten my joy, You are my shield. I praise You that you have been a stronghold of faithfulness to which I can continually come. Praise God by Remembering and Thanking Him for All He’s Done. Throughout Psalm 18, David remembers and praises God for delivering him from the hands of Saul. “He reached down from on high and took hold of me; He drew me out of deep waters. He rescued me from my powerful enemy, from my foes, who were too strong for me” (Psalm 18:16-17). Who or what is the “Saul” in your life? It could be that the Lord has rescued you from depression or darkness. It could be that the Lord has delivered you from fear. It could be that He has kept you alive through cancer, or that He has rescued you from financial ruin. Take time to remember. Lord Jesus, I praise You that when I felt hopeless, You rescued me and brought me up from the pit of despair. You set my feet on solid ground when it felt like the earth was shaking. Thank You that when my worries were many, You brought me peace. When my fears felt crippling, You bolstered my faith. I praise You, Lord Jesus. “My God turns my darkness into light” (Psalm 18:28) – Lord Jesus, I praise you that when life feels dark You are the light of the world. You promise to turn my darkness into light. Thank You, Lord Jesus. “With your help I can advance against a troop; with my God I can scale a wall” (Psalm 18:29) – What wall are you facing this week? A big project? A family situation? A financial crisis? A move? – Lord Jesus, I praise You that with your help I can scale the wall in front of me. Help me to remember that as I face challenges, You have gone before me to empower and enable me to do impossible things through Your strength. Thank You that You are for me and not against me. I praise You in advance for how You will work in my life. Friend, spend some time just reading, underlining, circling, and marking key verses in Psalm 18. Use it as a pattern for your praise. As you internalize Scripture, you’ll find your thinking will change. Give it a shot this week! Steve and I are finishing a week of vacation in California, and then for the next few weeks I’ll be home. Home is such a nice place! Even though I love what I do and I love all the travel, sometimes it’s nice to be home. Please pray as I finish writing the listener’s guide for the videos for Who Do You Say That I Am? Please pray as we think through the best strategies for the release of the video series for Who Do You Say That I Am? If you’d like to use the videos in your small group or in your church Bible study, I’m happy to say that Moody has priced them at $24.99, which is very affordable! They will be available on August 7—please pray as we release them!